I’m cheating a bit putting this meatball recipe in. Instead of being my mother’s recipe it actually comes from my mother-in-law. Sadly she passed away many years ago. I wasn’t lucky enough to be able to enjoy her great cooking at its best, but my husband remembers many of her dishes including how she learnt to make Fried Rice from the chef at their local Chinese restaurant, her light sponges and jars of preserves. Some of my favourite recipes that I have from her are a Beef Stroganoff, a rich Beef Burgundy and this meatball recipe which is another easy family meal. Combine minced steak and ½ packet of French Onion soup. Form into 8-10 meatballs. Place in casserole dish** together with the onion, celery, tomatoes and potatoes. Combine the remainder of the soup mix with 1 cup of water and pour over meatballs. Bake in a hot oven 200°C for 1 hour. Serve with buttered peas. Serves 4. **The original recipe was cooked in an Oven Bag and this is still a good way to cook it. Put all the ingredients in an oven bag and secure with a twist tie. Place oven bag in a baking dish. Pierce top of the bag with a fork -bake as above. 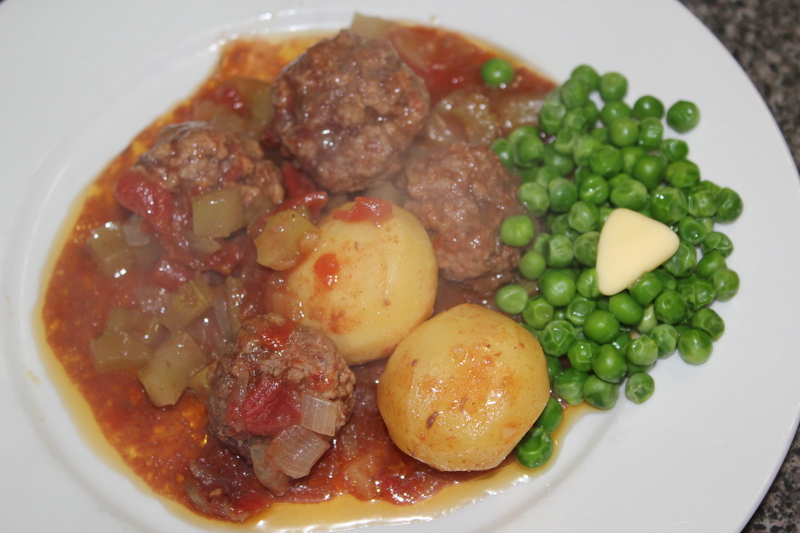 This entry was posted in All Recipes, Beef, Main Dishes and tagged 1970s, meatballs by bebsrecipes. Bookmark the permalink.